Chicken souvlaki with tzatziki sauce. 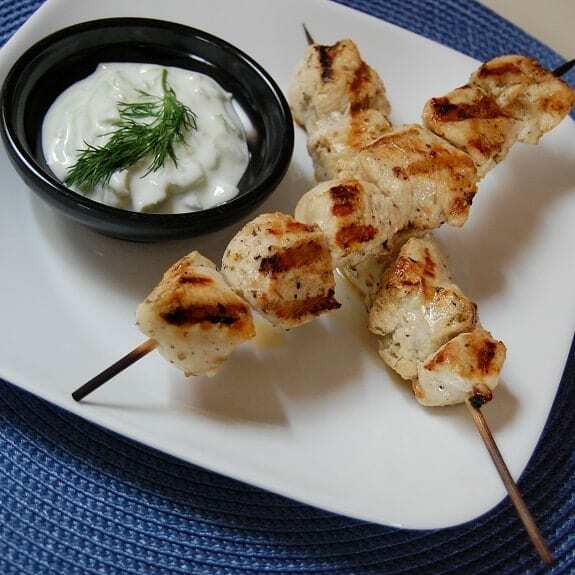 Marinated chicken breast cubes cooked under grill and served with delicious homemade tzatziki sauce. In a large mixing bowl,combine all ingredients. Mix well,cover and refrigerate for 1-8 hours. Tread marinated chicken onto skewers. Arrange on a lightly greased broiler rack. Place 4-inches(10 cm) from the heat. Broil under preheated boiler for 4 minutes. Turn and broil for 4-6 minutes longer. Serve with tzatziki sauce (recipe follows). Tzatziki Sauce: Line a strainer with cheesecloth. Spoon yogurt into strainer. Drain and refrigerate for 1 hour. In a strainer,combine cucumber and salt. Drain for 30 minutes.Pat cucumber dry. In the same strainer,combine drained yogurt,cucumber,garlic,dill,mint and lemon juice. Mix well and add seasoning.